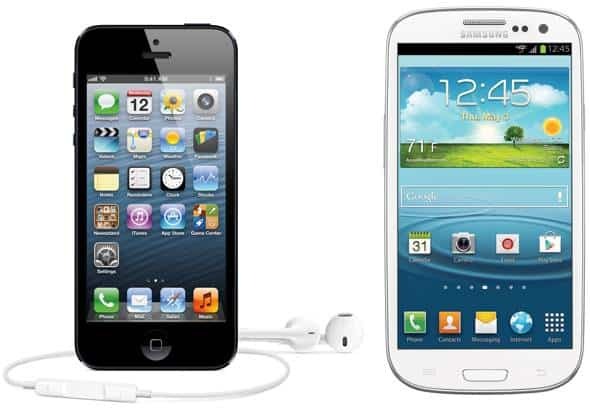 With the release of the new iPhone 5, tech enthusiasts and others planning to buy smartphones will be faced with a tough decision: Apple iPhone 5 or Samsung Galaxy S3 – which one to choose. We are going to compare the two phones here and try to help you to figure out which one is better for you. Before we dig into the comparison, it is important to mention here that both Apple iPhone 5 and Samsung Galaxy S3 are great smartphones. Both of them have their own set of features, and both of them have something that lets it get an edge over the other. The design of iPhone 5 features a metallic body purely made of glass and aluminium, while Galaxy S3 is made of plastic. Owing to the pure glass-aluminum build, iPhone 5 has a clear edge. When it comes to the build quality, Samsung has never been the best of choices, but it has improved a lot over the years, and it’s not too bad. But still, it is nowhere near the picture perfect metallic finish offered by iPhone. As far as dimensions are concerned, iPhone 5 (123.8mm x 58.6mm x 7.6mm weighing 112 grams) is thinner and more lightweight than Galaxy S3 (136.6mm x 70.6mm x 8.6mm weighing 133 grams). The iPhone 5 is powered by Apple’s own brand new A6 processor, which Apple claims to be twice as powerful as its predecessor A5 with 1GB custom RAM. The Galaxy S3, on the other hand is powered by the 1.4GHz Quad Core Exynos processor topped with 1GB of RAM (News is going around that a 2GB Galaxy S3 is well under way!). To make a choice between the processing powers of the two is really tough. That being said, it has to be kept in mind that Apple makes hardware suited to run its own set of softwares and OS, while Samsung makes custom hardware in order to run Google’s Android OS 4.0. Apple fine tunes the hardware on iPhone 5 to provide the best possible platform to run the new iOS 6 and its apps. Samsung’s hardware has to explicitly support Android 4.0 Ice Cream Sandwich since it comes from a different manufacturer altogether (Google) and so it might not be “fine-tuned”. Both the phones come with 16GB and 32GB memory variants, but Apple iPhone 5 has an additional 64GB variant too (though a 64GB variant for Galaxy S3 is set to release this October). But Samsung Galaxy S3 offers expandable memory up to 64GB with microSD card whereas iPhone 5 does not feature any such additional memory. Regarding storage, thus, Samsung Galaxy S3 is a clear choice. Galaxy S3 has a 2100mAh li-ion battery which is user-replaceable. Thus S3 users enjoy 790 hours of standby time with 11 hours of 3G talktime and more than 21 hours of 2G talktime. iPhone 5 bears a 1400mAh battery and offers 225 hours of standby time and up to 8 hours of talktime. Also, iPhone’s battery is non replacable, which makes Samsung Galaxy S3 the choice for greater battery life. When it comes to the display, Galaxy S3, with its huge 4.8 inch S-AMOLED screen is a clear winner even over iPhone 5’s newly expanded 4.0 inch Retina display. The Galaxy S3 hosts a screen resolution of 1280 x 720, compared to only 1136 x 640 for iPhone 5. Even if iPhone has a very little edge over Galaxy S3 when picture clarity is considered (326 ppi for iPhone 5 against 306 ppi for Galaxy S3), Galaxy S3 has a significant edge over iPhone 5 in terms of display. So if you want a bigger display, you can choose Galaxy S3. Both iPhone 5 and Galaxy S3 have very good front and rear cameras. Both the phones feature an 8 megapixel back-side illuminated sensor. iPhone’s iSight camera takes high quality pictures and supports the special Panorama feature, while Galaxy S3 offers similar features with Autofocus and Face & Smile detection. Galaxy S3 gets a slight edge with its front camera (1.9 megapixels) over iPhone’s 1.2 megapixel front camera. Additionally, Samsung Galaxy S3 supports near-field communications (NFC) which is not available in iPhone. Both iOS and Android have similar things to offer where software features are concerned. Finding an edge is difficult here. Apple iOS has Siri, Android has Google Now (Galaxy S3 has S Voice); iOS has integrated iCloud, Android has Google Drive; iOS has App Store, Android has Google Play. But Apple manufactures both the hardware and software, so one can say that iOS 6 is designed to run best on iPhone 5. On the other hand, Google’s Android 4.0 OS, codenamed “Ice Cream Sandwich” is made to run on Galaxy S3. The “run best” factor may not be applicable here as the hardware and software comes from different manufacturers. iPhones can upgrade their OS anytime to hold the newest version. Samsung may take a long time to accommodate the latest version of Android on its device. So, if you are looking to upgrade your phone from time to time, iPhone is a better choice. Both the phones are very good in terms of network connectivity, running on 4G LTE. However, Apple is not good at simultaneous voice and data exchange over LTE. So if you are planning to browse the web often while speaking over the phone, go for Galaxy S3. Both the devices have standard Bluetooth 4.0 and Wi-Fi a/b/g/n connectivity. For file transfer, Samsung Galaxy S3 has a microUSB port while Apple iPhone’s port is entirely different and unique. iPhone 5 is set for its release in the United States later this month. Release dates for other countries are yet to be disclosed. The functionality of iPhone may vary from region to region. Some iPhone 5 features, if not most, will be available in some limited number of countries only. There are a lot of dependencies concerning this, including network operators, geo-location, etc. See whether your favorite iPhone 5 feature is available in your country/region or not. For a more global access, Galaxy S3 is a better choice. To sum up, both Apple iPhone 5 and Samsung Galaxy S3 boasts its own set of features and both make a good smartphone choice. The choice you make solely depends on your requirements. Galaxy S3 offers features mostly available on a global scale while having an iPhone is a matter of prestige in itself. For many users, it’s like an invaluable piece of gem. But the battle between Samsung and Apple has only just begun, and one of Samsung’s recent commercials is direct comparison with iPhone 5, claiming that “The Next Big Thing is Already Here”. As far as the products are concerned, both Apple iPhone 5 and Samsung Galaxy S3 face big completion from each other.